â&#x20AC;&#x153; I recommend Spry to my patients and closest friends as an effective way to protect their teeth no matter what they are doing. I personally never climb without my Spry Gum.â&#x20AC;? keeping your balance Regulate your hormones, naturally. make your body an inflammation-free zone Feel better with healing foods and herbs. Get help for spring allergies. Boost energy with superfood drinks. Swap your cocktail for a relaxation drink. 23	Everyday Remedies Strategies to banish dandruff. Newsworthy I was pleased to see the news item in this month’s “Health Pulse” regarding evening exercise and its very minor effects on sleep. I often work out in the evenings, sometimes quite late. I prefer to do my exercising during the day, but life often—very often—gets in the way. A day doesn’t feel complete to me unless I’ve sweated and strained a bit, so I was happy to read that the impact on my sleep is negligible. I always thought that was true; it was nice to see some research backing it up. I write most of the brief news items for remedies and its sister publications, which helps me stay in touch with day-to-day findings in the health and fitness world. Such news is often contradictory. One day we’ll be reading about a newly discovered benefit from omega-3 fatty acids or probiotics, and the next day another study that seems to refute it. Overall, of course, the trend is very positive for both of those supplements. I try not to get too excited about any single study, whether it’s positive or negative. This issue of remedies has good news for nearly every part of your body, from protection against common vision problems to natural treatments for dandruff. “Make Your Body an Inflammation-Free Zone” (page 12) literally does cover the entire body. Systemic inflammation can cause heart disease, diabetes, and other maladies. Herbalist Maria Noël Groves offers lifestyle, diet, and supplement advice for taming the fire within. Hope all of your news this month is positive! EDITORIAL ADVISORY BOARD Jeffrey Blumberg, PhD, FASN, FACN, CNS, professor, Friedman School of Nutrition Science and Policy and director, Antioxidants Research Laboratory, Jean Mayer USDA Human Nutrition Research Center on Aging, Tufts University; Mark Blumenthal, founder and executive director, American Botanical Council, editor/publisher of HerbalGram, senior editor, The ABC Clinical Guide to Herbs; C. Leigh Broadhurst, PhD, research geochemist, author, Natural Asthma Relief and Prevent, Treat, and Reverse Diabetes; Steven Foster, photographer, herbalist, and senior author of three Peterson Field Guides, author of 101 Medicinal Herbs, A Desk Reference to Nature’s Medicine and more, associate editor of HerbalGram, the journal of the American Botanical Council; John Neustadt, ND, founder of Montana Integrated Medicine, coauthor, A Revolution in Health Through Nutritional Biochemistry; Lisa Petty, RHN, RNCP, holistic nutrition consultant, author of Living Beauty and host of the health talk radio show Lisa Live; Dana Ullman, MPH, author of The Homeopathic Revolution: Why Famous People and Cultural Heroes Choose Homeopathy and other titles on homeopathy; Marc Ullman, partner at Ullman, Shapiro & Ullman, chairman, Legal Advisory Counsel, Natural Products Foundation; Amber Lynn Vitse, CN, is certified in Integrative Nutrition, a fusion bodyworker, and an Ayurvedic practitioner, and writes on health issues. 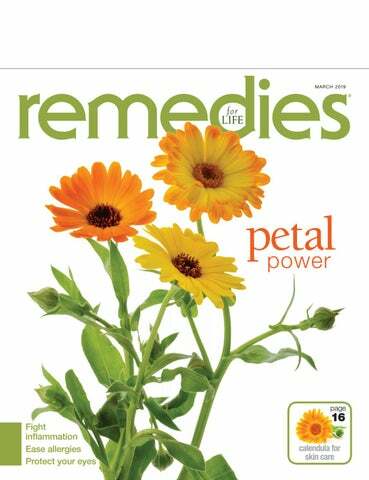 remedies is published monthly by Taste for Life, 149 Emerald Street, Suite O, Keene, NH 03431, 603-283-0034 (fax 603-283-0141); ©2019 Connell Communications, Inc. All rights reserved. This magazine is not intended to provide medical advice on personal health conditions, nor to replace recommendations made by health professionals. The opinions expressed by contributors and sources quoted in articles are not necessarily those of the editor or the publisher. Advertisers and advertising agencies assume liability for all content of advertising and for any claims arising therefrom. Information appearing in remedies may not be reproduced in whole or in part without express permission of the publisher. Creative and Sales Offices: 149 Emerald Street, Suite O, Keene NH 03431 603-283-0034 Printed in the US on partially recycled paper. The inks used to print the body of this publication contain a minimum of 20%, by weight, renewable resources. www.lilyofthedesert.com *These statements have not been evaluated by the Food and Drug Administration. These products are not intended to diagnose, treat, cure or prevent any disease. Physical activity should be a key component of treatment for Type 2 diabetes, according to a new recommendation. “Sedentary lifestyles and unhealthy diets are the most important drivers of the increasing number of patients with Type 2 diabetes and cardiovascular problems such as heart attacks,” said cardiologist Hareld Kemps, MD. He stressed that diabetes doubles the risk of mortality, but exercise significantly reduces the risk. Taking psyllium for several months can lower unhealthy cholesterol by about 10 percent, according to a recent analysis of studies. The high-fiber seed is usually used to treat constipation. The analysis, published in the American Journal of Clinical Nutrition, determined that taking about two teaspoons per day provided seven grams of soluble fiber and reduced LDL cholesterol and other markers of coronary risk. Spring arrives later this month, but the leaves on the trees and the bulbs we planted last year are not the only companions the season offers. Allergies come along with these new beginnings, and while many people turn to antihistamines for relief, there are natural remedies that can help you embrace GINKGO the outdoors fearlessly. BILOBA Astragalus Astragalus stimulates the immune system as it eases allergy symptoms. Studies show the greatest benefit of this traditional Chinese medicine is that it provides relief from that annoying runny nose. Bromelain Bromelain, an enzyme found in the stem and fruit of the pineapple plant, breaks down proteins in swollen tissues, like inflamed sinuses. Look for bromelain in supplement form. Ginkgo Ginkgo biloba has been used in Chinese herbal medicine for more than 5,000 years. This known anti-inflammatory helps treat symptoms of allergies and coughs. Quercetin Quercetin is an antioxidant found in almost all herbs and plant foods. Quercetin eases allergy symptoms as it halts the growth of cells that secrete histamine, but it doesn’t cause drowsiness like antihistamines. It is especially abundant in apples and green tea. For maximum effectiveness, consider taking this ingredient in supplement form. Did You Know? Saline nasal irrigation using a neti pot clears irritants and mucus from the nasal passages. Use sterile, distilled, or previously boiled water. Wash the device after each use. Stinging nettle Don’t let the name scare you! Nettles, when cooked or dried and eaten as a vegetable, provide an antihistamine. Nettles may also be boiled and made into tea, added to soups or stews, or taken in supplement forms. FREE Report… Drinking Water Scams Exposed! Which water is best for you? Inflammation means to inflame or engulf in flames. Like fire, it has benefits. It’s part of our healthy immune response to pathogens and helps initiate repair on damaged tissue. But when the fire rages out of control or smolders long-term, its effects throughout your body can be devastating. Not only will it increase pain, but it also increases your risk of heart disease, diabetes, cancer, Alzheimer’s disease, and hormone imbalance. Fortunately, how you live, what you eat, and the supplements you take can dramatically reduce excessive inflammation in the body and reduce your risk of serious disease. Diet & Lifestyle By far, diet and lifestyle choices make the biggest impact on your body’s inflammation levels. Focus on whole foods and lots of plants with a low to moderate glycemic index, avoiding foods that you’re allergic or sensitive to. If you eat animal products, opt for pasture-raised meat and eggs in moderation. Omega-3 fatty acid supplements and wild-caught fatty fish and seafood consumed regularly dramatically reduce inflammation. Exercise consistently, manage your stress levels, and get a good night’s sleep. Meditation and yoga can help. Turmeric & Other Spices The spices on your rack pack more anti-inflammatory action, ounce for ounce, than almost anything else you can eat. Turmeric and its curcumin constituent set the stage as the most-studied substances for reducing inflammation, including chronic pain, heart health, cancer, and brain health. But don’t stop there! Ginger, cinnamon, and a pinch or two of cayenne and black pepper are all linked to reduced inflammation and support in a wide range of diseases. Enjoy them in your tea, liberally added to food, and in recipes like golden milk (½ teaspoon of turmeric powder in hot milk with a little honey… I like to add a pinch of black pepper, cardamom, and nutmeg). Make a powdered mix of 60 percent turmeric, 30 percent cinnamon, 9 percent ginger, and 1 percent pepper to sprinkle liberally in oatmeal, smoothies, etc. (These spices may interact with some medications. Ask your healthcare practitioner.) Use fresh ginger, rosemary, garlic, and onions in your recipes, including stir-fries, soups, and broths. in food (including salads and fresh lettuce spring rolls or wraps), tea (personal favorite! ), or in supplemental form to help protect against general inflammation including pain, blood sugar imbalance, heart disease, and cognitive decline. They also help improve mood and foster calm energy and focus. Favorite tea blends include tulsi with green tea; fresh rosemary with a lemon wedge; any combination of the five herbs; and any of the above herbs mixed with green tea (another excellent anti-inflammatory herb). You’ll be amazed at how much better you feel when you incorporate these healing foods and herbs into your routine! Maria Noël Groves, RH (AHG), best-selling author of Body into Balance: An Herbal Guide to Holistic Self Care and the forthcoming Grow Your Own Herbal Remedies, sees clients and teaches in New Hampshire. Learn about herbs, her books, distance consults, online classes, and more at www.WintergreenBotanicals.com. If you’re savvy about nutrition, you know the best way to get your vitamins and minerals is by eating a balanced diet heavy on the fruits and veggies. But if you want to improve on the benefits you get from incorporating fresh produce into your meals, you can easily do so via superfood drinks. Super food, big benefits “Superfoods” is an umbrella term that refers to food rich in vitamins and nutrients along with inflammation-fighting antioxidants. 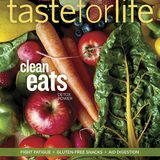 They include leafy greens, berries, seeds, spices like turmeric, and blue-green algae. The benefits of superfoods are legion: Research has found that the antioxidants and flavonoids that many contain can ward off cancer and coronary heart disease, boost immunity, and lessen inflammation and stress. The nutrients in fruits and vegetables up your energy and help maintain a healthy weight. Easy to swallow Superfood drinks are made from dried, concentrated foods in powder form. They can be bought as single ingredients but are more frequently found as mixes. Just stir a couple of tablespoons into your favorite drink. As estrogen levels start to drop for women during perimenopause, collagen production decreases. Diminishing collagen leads to thinner, weaker skin that not only starts to lose firmness, but may also become more susceptible to injuries and slower wound healing. Just as damage comes from the inside and the outside, so too can your collagen protection strategy. A winning combo Collagen is composed of amino acids, including the nonessential amino acids proline and hydroxyproline. While your body can make these amino acids as required, they cannot be synthesized without vitamin C. To support collagen production, then, be sure your diet contains adequate vitamin C from fruits and vegetables. Consider boosting your vitamin C intake with supplements if you’re feeling stressed. Research shows that the adrenal glands (along with the brain) use most of the vitamin C in the body, excreting vitamin C during times of stress. Keeping topical Studies show that the use of topical formulations containing vitamin C induces the synthesis of collagen as does treating skin with kaolin-containing clay (good to know for when you choose your next facial mask). Calendula officinalis applied topically has been shown to increase the hydroxyproline content in the skin. The antioxidant action of the topical application of patchouli oil also seems to boost collagen production, improve skin elasticity, and prevent UV-induced damage to collagen. Berry flavored Youtheory Collagen Liquid is a refreshingly tasty way to give your skin the building blocks for a healthy and youthful appearance. NOW BioCell Collagen from NOW Foods is a versatile nutritional supplement that supports both joint health and moisture retention in mature skin. relaxation drinks can ease the strain Looking for an alternative to your cocktail-hour beverage? If you want to unwind from a stressful day, the idea of a nonalcoholic relaxation drink —the opposite of an energy drink—may appeal, especially if you have difficulty falling asleep at night. Relaxation beverages were introduced to consumers about a dozen years ago. In 2014, Business Insider pegged the US market for these drinks at $153 million. Forbes anticipates annual revenue growth at close to 25 percent annually. The first relaxation drinks contained just one active ingredient: gamma-aminobutyric acid, also known as GABA. The human brain naturally produces GABA, but it can also be taken as a supplement to relieve anxiety. Since then, beverage makers have sold drinks that combine numerous active ingredients, including herbs, amino acids, and other supplements. In addition to GABA, common ingredients include L-theanine, kava, valerian, chamomile, passionflower, 5-hydroxytryptophan (5-HTP), and melatonin. These ingredients have been found in scientific studies to perform various functions, including relaxing muscles, reducing stress and anxiety, and improving sleep. Valerian, for example, can help with sleep and anxiety. L-theanine, found naturally in tea leaves, can lower anxiety and improve focus. Melatonin can improve sleep. 5-HTP may help raise levels of serotonin, which can help with anxiety and sleep problems. While many people brew teas with some of these ingredients or use them in supplement form, the idea of being able to buy “on-the-go” drinks has its appeal. If you’re trying to lose weight, the magic numbers are between 55 and 66—degrees Fahrenheit, that is. Shivering is the body’s way of staying warm. It increases our resting metabolic rate, which leads to more calories burned. But researchers have found you don’t need to get that cold to boost metabolism. Regular exposure to cooler temps— but not so cold that you are shivering—increases calorie burn in a phenomenon called nonshivering thermogenesis (NST). NST can increase calorie burn from a few percent all the way up to 30 percent in healthy young and middle-aged people, according to research conducted at the Netherlands’ Maastricht University. One study found that middle-aged men who spent two hours a day for four weeks in a 62.6°F environment burned more body fat. Researchers are excited about cold therapy, not just for its potential in treating obesity, but also for how it may help with conditions such as Type 2 diabetes. One small study conducted by Maastricht University had eight overweight men in their late 50s with Type 2 diabetes sit in a 57°F room six hours a day for 10 straight days. At the end of the study, the men’s bodies metabolized glucose 43 times more efficiently than when the study began. Scientists have found that time in the cold increases our body’s store of brown fat. The function of brown fat is the opposite of that of white fat, an excess of which is associated with Type 2 diabetes, heart disease, and certain cancers. While white fat stores calories, brown fat burns calories to generate heat. Adults carry tiny deposits of brown fat in the neck, upper backs, and along the spine. We lose brown fat as we age, men to a greater degree than women. People with higher levels of brown fat have higher metabolic rates, greater insulin sensitivity, and better blood sugar control, and they tend to be slimmer. In one study, people who slept in rooms kept at 66°F almost doubled their levels of brown fat in four weeks. Cold hacks People are experimenting with ways to use cold therapy, or cryotherapy, to lose fat. CoolSculpting is a medical procedure in which fat deposits get frozen. The body naturally removes the dead cells over several months. Whole body cryotherapy (WBC) is a controversial—and potentially dangerous treatment—that has scantily clad people stand in a deep-freeze tank, where they are exposed to subzero temperatures for a few minutes. People seeking cheaper, safer forms of cryotherapy are adopting DIY methods. Some drape their necks with ice wraps to lower body temperature. The Cold Shoulder is an ice vest that people fill with cryoMAX gel packs—the types available at the drugstore for pain relief. Others end each shower with a blast of cold water to the back of the neck. Others go old school—simply getting outside to walk, ski, or skate. Outdoor exercise in slightly uncomfortable cooler weather may be an ideal approach to pursuing fat loss. Research has shown that it causes muscles to release an enzyme that can turn some white fat into brown fat. Cool News When swimmer Michael Phelps was competing in the 2008 Olympic Games, it was widely reported that he was consuming 12,000 calories a day. Even running a marathon would necessitate only 2,600 calories. So why did Phelps not gain weight? The theory is that he was burning extra calories just by spending so much time in the pool, where water temps were around 70°F. dandruff What is it? Dandruff is a shedding of skin or flakes of dried, excess sebum (an oily, lubricating fluid) from the scalp, which leads to white flakes on the head, neck, and shoulders. What causes it? Eczema, which causes increased shedding of normal scalp skin cells; fungal or yeast infections; hormonal or seasonal changes; poor circulation; stress. Food allergies may make it worse. aged garlic extract; omega 3 fatty acids; probiotics; zinc. Brazil nuts and seafood; fresh fruit and vegetables; whole grains. Avoid animal protein and foods high in saturated fats, salt, and sugar. antifungal ingredients like neem, rosemary, tea tree oil, and thyme. Other botanicals that can soothe the scalp include aloe, arnica, calendula, chamomile, cherry bark, and holy basil. ingredients or chemicals that will dry the scalp. Rinse well after shampooing and conditioning. Massage the scalp with almond, jojoba, or diluted tea tree oil once a week. help with dandruff when mixed with a carrier oil and massaged into the scalp, or blended with an unscented natural shampoo. They include bergamot, clary sage, cypress, geranium, juniper, lavender, lemon, and ylang-ylang. Ridgecrest Herbals’ EssentialEyes provides full-spectrum eye support to help support natural recovery from the effects of blue-light damage caused by constant technology overuse. Xlear Rescue Nasal Spray with Xylitol, the newest nasal spray form Xlear, is geared to help alleviate congestion from the flu, colds, sinus infections, and ear infections. Kyo-Dophilus from Wakunaga of America contains three biocompatible human strains—the Friendly Trio— that support a healthy digestive and immune system. Youtheory Collagen Powder is enhanced with vitamin C to promote internal collagen production and biotin to support powerful health and beauty benefits while on-the-go. Every year that goes by, your chances for vision loss go up. It’s a sad fact that by the age of 65, one in every eight adults will experience at least some amount of compromised vision. The top causes of impaired vision include cataracts, age-related macular degeneration, glaucoma, and diabetic retinopathy. Here’s how you can help preserve your eyesight against these threats. Age-related macular degeneration (AMD), a leading cause of blindness, is a progressive disorder affecting the central part of the retina, called the macula. The macula gets damaged from constant UV light exposure, but certain nutrients act as a shield against this damage. As with cataracts, the carotenoids lutein and zeaxanthin are heavylifters here. Keeping levels of those two nutrients abundant pays off by lowering the risk of fading vision in the future. The omega-3 fatty acids in fish oil also merit mention. Diets that include fish regularly, as well as this nutrient in supplement form, guard against AMD and can sometimes regain lost vision in certain people. Glaucoma Anyone over age 60 is considered at high risk of glaucoma—the condition that increases pressure in the eye (specifically on the optic nerve), which can result in blindness. As with AMD, omega 3s show promise with this eye condition. Specifically, supplementing with DHA has been shown to reduce pressure in the eye, based on research in a population who already had glaucoma. In addition, plenty of vitamin C—once again this antioxidant shows its support for healthy vision­—is linked to protection from developing glaucoma. The Almased Weight Loss Phenomenon™ Discover It Now! A scientifically proven formula that optimizes the metabolism and helps the body lose weight while providing a natural energy boost over the whole day! Quality you can feel, results you can see! Start your Almased Journey today at www.figureplan.com (enter source code RE03C). Look for us in your favorite health food store. You can also find us online. Call toll-free for more information: 1-877-256-2733. 12 Sugar Alternatives A spoonful of sugar may seem relatively harmless. It does, after all, make the medicine go down. But it’s the amount of it that we ingest every year (around 77 pounds per person!) that’s the real problem. A nonnutritive substance, refined white sugar increases inflammation and oxidative stress and is linked to the obesity and diabetes epidemic. It’s also a known immunosuppressant and has been shown to reduce the germ-killing ability of white blood cells for up to five hours after consumption, according to nutrition expert Ann Louise Gittleman, PhD. That’s enough to make anyone feel ill! But there may be those times when you want to enjoy something on the sweeter side of life. Keeping hormones in balance can be a tricky business for women throughout the lifespan. Starting at puberty and continuing until about age 40, many women experience symptoms related to excessive estrogen—namely PMS. Hormone changes around pregnancy can also create challenges. Then, from age 50 onward, too little estrogen can lead to discomforts associated with menopause. Fortunately, a few key supplements can help women reach that elusive sweet spot of hormonal balance—no matter which decade they’re in. The PMS rollercoaster “Estrogen, although it is ‘friend,’ can also be ‘foe,’ in that too much at the wrong time can cause hormonal havoc,” explains Laurie Steelsmith, ND, LAc, author of Growing Younger Every Day: The Three Essential Steps for Creating Youthful Hormone Balance at Any Age (Daily Wellness Company, 2017). In women from teens through menopause, estrogen dominance contributes to the PMS symptoms of irritability, weepiness, moodiness, bloating, breast tenderness, and fatigue. Lowering estrogen and enhancing production of another hormone, progesterone, can reduce these symptoms. To lower estrogen, Dr. Steelsmith recommends exercise. “Work out, sweat, and move every day to help your liver do its job of detoxifying your body, including estrogen,” she explains. In addition, choose foods that help the liver break down estrogen; these would be cruciferous vegetables such as broccoli, cabbage, cauliflower, and Brussels sprouts. These veggies contain compounds like indole-3-carbinol that convert unfriendly forms of estrogen into friendly forms. “Consider boosting your liver function with beets and dandelion tea (an herb known for its ability to help your liver make bile) and it has the bonus as a slight diuretic that helps with bloating,” says Dr. Steelsmith. She’s also a fan of vitamin B6, since it helps the liver break down estrogen, acts as a natural diuretic, and can enhance mood by activating “feel good” brain chemicals such as serotonin. For the second half of the estrogen/progesterone equation, Dr. Steelsmith suggests boosting the body’s ability to produce progesterone with chasteberry. This herb can alleviate PMS symptoms and restore progesterone balance. Clean, clinically studied whole food ingredients to support brain health at three stages of life† Kids • Young Adults • Adults 40+ † These statements have not been evaluated by the Food and Drug Administration. This product is not intended to diagnose, treat, cure or prevent any disease. Revitalize beautiful skin, hair and nails* no matter where you are.